Come join our Gold Medal Team ! UT Challenger Sports is a co-ed recreation program that enables children and young adults with intellectual and/or developmental disabilities to enjoy the benefits of team sports participation in an adapted environment structured to fit their abilities. 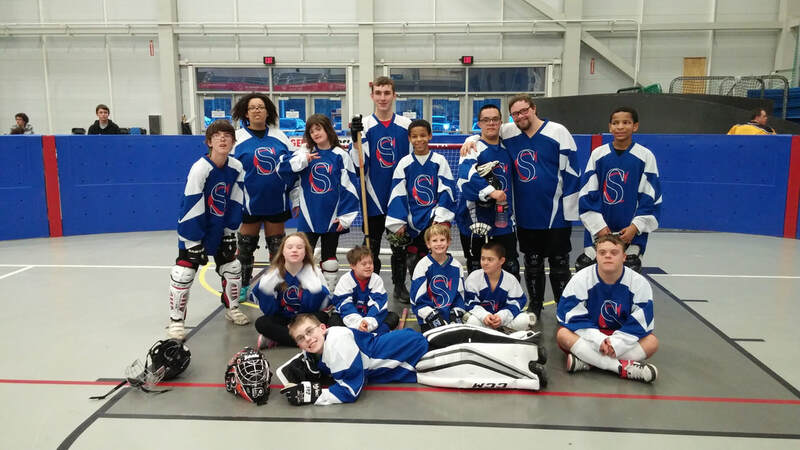 UT Challenger Sports is participating in Special Olympic Floor Hockey Team league competition for ages 8 and up. Evaluation sessions: Saturday 10/6 & 10/13 9:30 am- 10:30 am Upper Township Primary School, 130 Old Tuckahoe Rd, Marmora This is a chance for your athlete to come out meet our team and give floor hockey a try. ​The Winter Games State Tournament will be at Stockton University , January 5-6, 2019 at Stockton University This weekend is mandatory for all players. Special Olympics does not allow players to be teamed up with buddies (or shadows) as we do in our soccer and baseball programs. Teams and players will be lead by coach and assistant coach. ​We recommend each player bring their own equipment for both safety and hygiene reasons. We have a limited supply of equipment to loan to our athletes. If you do not have equipment we can arrange a time and place to go through our supply. Helmet with full mask such as a street hockey helmet...padded gloves such as street hockey or field hockey gloves but not ice hockey gloves...shin guards such as street hockey, ice hockey or soccer. Its suggested to get shin guards that cover knee to ankle because floor hockey sticks can hurt. Player must be accompanied by a parent/guardian for practices. Players should arrive by 9:15am and be ready to start by 9:30.